Yesterday, I celebrated Digital Learning Day with television cameras in my face and boom microphones dangling over my head. Don’t worry. I wasn’t in trouble. Instead, a crew from the Fox News network out of New York City traveled to my small school in Western Massachusetts to document an hour lesson around digital footprints and digital citizenship for a special they are producing in a couple of weeks. Fox News Host John Roberts, fresh off the plane from the previous night’s grilling of Rep. Eric Cantor (whose ideology is as far removed from Western Massachusetts as I think you can get), hung out in my classroom as my students discussed privacy issues, data collection from companies, Facebook and Instagram, and their own media lives. I’ve known the television folks were coming for a few weeks now, and my students were ready. “Act natural,” I told them in the morning. We all laughed at that. They did more than that. While the class Fox joined is a wonderful one, the students really upped their game yesterday. They were articulate, thoughtful, and fully engaged in the discussions we were having about how the things they do now online impact the way people will perceive them in the future. John Roberts spent some of the time asking them questions about their own use of technology, whether parents talk to them about how they use websites, and what kind of steps they take to protect themselves. (He had his questions written out on his cell phone, which he kept pulling out to read to the class, ironically). At the end of the class, as my students were huddling to line up for their class, Roberts was right in their midst, having informal conversations with them about digital media. (I forgot to pull out my camera! Doh.) It was a nice moment, you know? Roberts also interviewed me, one-on-one, in the morning, asking about why I think teaching 11 year olds about the concepts of digital citizenship is important. I think I was pretty articulate, too (although who knows what will end up on the cutting floor and how I will be portrayed.) Their larger piece is about data mining, and privacy issues, so I can’t say how much of our discussions will end up in the hour-long program (I suspect just a few minutes). While I was a little nervous about having a television crew in the classroom (and Fox, to boot), they were very kind and understanding, and appreciative of the time. And if my own message gets out there to more teachers and parents about being vigilant about privacy, sharing and what companies do with our data, than it was time well-spent. I’m just hoping I am portrayed in the “fair and balanced” light. 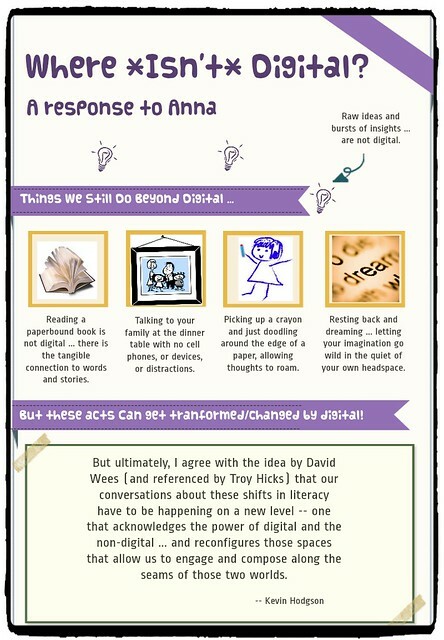 This is part of an ongoing series of discussions I am having with my good friend, Anna Smith, about digital literacies. (You can follow the entire thread of our back and forth talks here.) 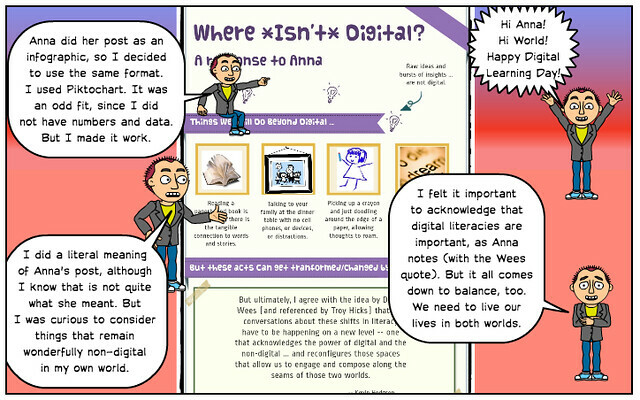 The other day, Anna asked the question of “where isn’t digital” as she considered a quote by David Wees about the importance of digital literacies in a technology/media-rich world. I could have gone in any number of directions here in response to her post, but I found myself thinking quite literally about the areas in my life when things are not digital, and how wonderful that is. It reminded me that technology can’t replace everything, and some experiences still require tangible connections (family) or intangible moments (dreaming). I gathered up some of the graphs from our recent survey on this Glogster poster which I will be sharing out with my students today to begin our discussions and inquiry around technology, digital footprints, privacy, cyberbullying and more. This is a great video lesson plan (with handouts available at CommonSense Media) about helping kids consider their digital footprints (which is what I am doing this week). I’ve been sharing out some of the data from a grade-level survey that I did with my students around their perceptions and use of technology and digital media. I’ve talked about how much time and what they do with that time, and also, I’ve shared out how many of my students use Facebook and Instagram. Today, I want to share out their views and experiences around online safety and cyberbullying. 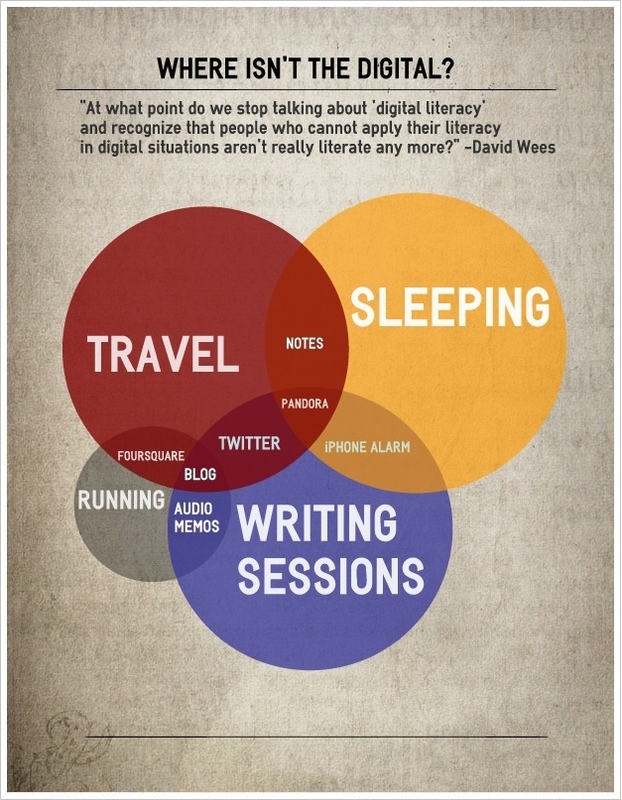 All of these topics will be part of our class discussions this week as part of our work around Digital Learning Day. This topic of safety is one that often falls below many of our radar screens until something has gone too far for the kids to deal with. I was curious if adults in their lives have talked about the issue of how to be safe when in an online space and what to do if the tone turns negative and maybe even threatening. I was pleased to see that about three-quarters of the students reported that they have had those kinds of conversations before with a teacher or parent. In looking at their narrative experiences, you can see that the line between other just being annoying and being threatening is very vague for my students (and, let’s be honest, for many adults). When a student says that another person writing in Spanish or “liking” a picture on a site that encourages that, they may be reading more into the activity than is there. But when a student says that there are too many incidents to even count, that is a cause for concern, I think. Parents/Teachers/Adults Talked About Online Safety? I also wanted to know if they had experienced this negativity in online spaces, and about one-third said they had. Some creep “liked” my pictures and I blocked him. Someone didn’t care about the Newtown ct. shooting so a big fight broke out on Instagram and the person who didn’t care had so many people against him, he just stopped typing. The guy was swearing a lot. It is not really a problem people post pictures that say this girl died and if you don’t re-post you will be next. Cyberbullying. I resolved it by going to a counselor. People swear at you and it has not resolved. I re-posted some of a girl’s pictures (what you are supposed to do and she said that I was “taking all her pics”) so I unfollowed her and yes it did work. A rude message was left for me in Minecraft and it did not get fixed. It was not resolved but someone kept calling me really bad things. Someone was talking Spanish, asked to stop, and they said something in Spanish. On fantage.com while I was playing (virtual world) and someone said those clothes you are wearing (on my character) are ugly. What I just did is clicked on them and then I reported them. Well, I don’t know how many negative experiences I’ve had online. There are too many to count. The people swear at you. Teenagers on Xbox live mocking my gaming abilities. People call me names on Xbox Live. Me and a person got into a really big fight. We have really never talk ever again. I saw an inappropriate and got it blocked from YouTube. One of the areas I will be addressing this week is privacy settings and letting them know there are ways to report bad behavior of other users to most online sites. I’ll also be reminding them that they have supportive adults at home and in school who they can turn to for help in situations that seem to be careening out of control. In a few weeks, the second annual Digital Learning Day will take place. Check out the Digital Learning Day site for more information and resources, and start planning now for how you and your students can take part in the celebration. Digital Learning Day, February 6, 2013, is a national celebration of teachers that shines a spotlight on successful instructional technology practice in classrooms across the country. Add your voice and expertise to tens of thousands of educators representing nearly 2 million students in ongoing activities, idea sharing, and collaboration leading up to the big event. Mark your calendar for February 6, 2013 and join the wave of innovation sweeping through our nation’s schools. Participation is free and easy. Yesterday (as part of Digital Learning Day), I brought all four of my sixth grade classes into Glogster.edu for the first time, and as expected (from past experiences), they loved it. They love the possibility of embeddable media, they love the clip art, and they love the colorful options of theme and “stickers” and more. But before they could even get their account information, we had a long discussion about “design principles.” For many of my students, this kind of thinking is new, although when we began to talk about Apple and its products, something clicked for a lot of them. I began by explaining some of my own thoughts around design, with an emphasis on web design. I then showed them my Glogster project (which I had shared with them the day before, as they knew they were going to be working on a Glog related to their short stories). I asked them to pick apart my thinking. Why did I choose what I chose, and how did those choices connect to my short story (which I had read aloud to them last week)? It was great. They noticed many of the elements that I wanted to notice. Then, I shared this following Glog with them. I took the same text but purposely went anti-design. You should have heard the “whoahs” and “I can’t read that” and “yikes” that accompanied the first look. Then, again, I asked them to break down what I did NOT do when it comes to design choices. We talked about colors, about busyness, about lack of theme, about no connection to the original text. I think they got it. Or most of them got it. Check out this project which a student began in class and then completed at home. I would say that it shows pretty decent design principles, don’t you?